Support Animals in Need in Baltimore - We Need Your Help! By donating to us today, so are you. 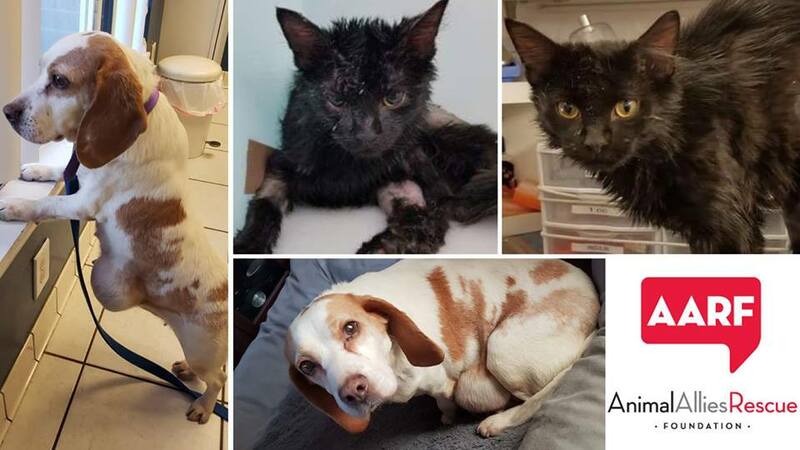 AARF takes in many animals whom otherwise would have been euthanized and not given a second chance without extensive and expensive veterinary care. AARF relies 100% on public donations to fund skyrocketing medical costs and accomplish our life-saving work. We can only continue to support animals who need it the most with your generous help. Please join us in helping to save and protect these sweet, innocent dogs and cats today! All donations are tax-deductible. Click here to donate and help Alexander and Yellow, two of our current abuse and neglect rescues. We process all credit card donations through PayPal. When you shop at Amazon Smile, a portion of your purchase price can be donated to AARF!! Just click on the link below (don’t forget to bookmark it) and be sure to use that link every time you shop at Amazon. If you forget the link, just search Amazon Smile and choose AARF as your charity. The dogs and cats of AARF thank you!! Happy shopping!! When you shop at Amazon Smile, a portion of your purchase price can be donated to AARF! Just click on the link below (don’t forget to bookmark it) and be sure to use that link every time you shop at Amazon. If you forget the link, just search Amazon Smile and choose AARF as your charity. The dogs and cats of AARF thank you! Happy shopping!